8 Dec 2011/Jan 2012 Thank you, thank you, thank you Anne Frey for your very informative article with your opinion on the Kenya top bar hive (The Bee Line, vol. 29, #5). It is something I have wanted to write about for some time, and I eagerly waited for your article — well done! Now I can share my views along with yours and other documented facts. I too have communicated with Tony Jadczak and other Master Beekeepers from Maine for ideas and concerns. Honeybees will conduct their natural activities according to instinct and not from what we humans provide them. As an applied Biologist for some 52 years and a beekeeper for 48 years (in Maine), I realize the insect is forever wild and not domesticated as cattle, poultry, horses, dogs and cats have been and which we humans have genetically manipulated for years. Yes, the honeybee genome has been developed, but we have not controlled or changed the natural swarming and feral instinct of the animal. We learn by observation and experimentation and some of that becomes applied through technology. The TBH is a methodology and technology from Greece and tropical Africa. Does this fact make Maine or any other state in the Northeast conducive to TBH management? In my opinion as well, the answer is no. Now, if we were to go to Wyatt Mangum’s climate in Virginia where he does successfully mange TBHs, it would be an acceptable practice and a challenge to become a profitable beekeeper practicing the art of TBH management. Wyatt has come to Maine and spoken to the MSBA in the past decade and he recently published his new piece on TBH history and his views in ABJ; vol. 151, #11, pp 1067-1069. His second piece appeared in ABJ, vol. 151, #12, pp 1165-1167. He discusses the importance of entrance location and the subtleties of comb-building behavior. He does stress the fact that combs must be straight for the management and control of parasites and diseases, and he uses a strip of foundation as a starter for straight, even foundation to make his frames more interchangeable for good hive management. He even discusses the use of Greek basket hives with interchangeable combs. Finally Wyatt emphasizes the mild winters in Eastern Virginia as being a positive factor for TBH management. Virginia has a much more temperate climate than Maine; in mid-Maine we find ourselves at the 45th parallel. The biology of the honeybee should be much better understood by “new-bees” in this art and science of beekeeping that many of us like so well — especially the new TBH enthusiast. The honeybee is an invasive species to North America, and like any invasive, it takes advantage and use of available habitat as quickly as possible to survive. The insect means no harm (however some native bees have not done well, due to competition). So the honeybee had to become well established to survive and it has done very well. The insect is a hoarder and gathers all possible sources of food (nectar and pollen) for storing to survive. The insect also must thermoregulate at high and very low temperatures in the northeast, especially in Maine. The winter cluster becomes smaller as the ambient temperature decreases. Here are some numbers from Dewey Caron’s work: at +50°F the cluster is 14″ to 16″, rather large and about what it should be in mid-November. When the ambient temperature is near 0°F, with lots of summer bees dying, the cluster is 12″ or less. At -14°F the cluster is about 10″, a major reduction in size. And at -20°F the cluster is only 6″. Then even down to 4″. Clusters this small in Maine are subject to winterkill. TBH managers in particular should think about this, because the insect has to thermoregulate and move to available food at the same time. It is not normal for the winter cluster to move horizontally (as is necessary in a TBH), whereas it is natural to move vertically (as in a tree, wall of a building, chimney and, yes, in a Langstroth hive). So the TBH does not provide for or allow natural movement. To my way of thinking and from what I have learned through decades of work, the TBH in my part of Maine is not conducive to the insect’s thermoregulation behavior for survival, and we cannot change this. Perhaps if one stood a long TBH on end, the bees could then move vertically and survive? ( Just joking.) The kind of space that is available is important for the insect’s survival. Storing adequate food for long Maine winters and expelling excess moisture with proper draft and ventilation does require more space or volume. I also want to emphasize that volume is very important to the honeybee, especially when swarming season arrives and TBH management becomes conducive to a chronic swarming problem. As we all know, we want to prevent or discourage swarming even though the instinct is there. We cannot eliminate the instinct, so why make the swarming issue even more difficult by crowding bees into TBHs. It takes the joy out of keeping bees and makes producing honey (if that is a goal) more difficult. I would like to see more data on winter survival, but for sure the NH experiment was worth telling, and thanks again to Anne for doing that. And yes, mite control is difficult with natural miticides due to the necessity of air movement from a vertical direction vs. horizontal. This makes TBHs non-conducive to mite control and therefore a major challenge to all beginners. In 1983 when EAS was held at the University of Maine at Orono, I was the President and Roger Morse was one of our key speakers on the program. At that time, he said, “beekeeping as we now know it will change forever when Varroa destructor arrives.” Roger was well ahead of the curve. And if today we have a proliferation of TBHs in Maine, we will see more Varroa cases with increased winter mortality. My conclusion, based on the current knowledge of TBHs in Maine, is this: If you want to keep bees for pollination and not manage them, just make sure you also understand that you are probably going to set yourself up for losses and big disappointment. However, as Past President of EAS and MSBA, it is further my responsibility to share my thought that advocating through lectures the purchase and use of TBHs in Maine through various entrepreneurs is very irresponsible and is on the verge of a shame. 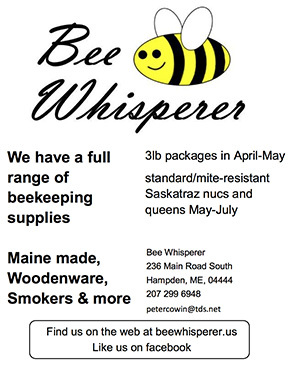 I do many lectures on honeybees in Maine from York to Penobscot to Washington County on a pro bono basis to provide the basic facts of science for this art and hobby and I do not advocate the use of TBHs. Especially if you want to keep bees, sell honey and pollinate crops. A scientist with several degrees, I was trained to be objective and open-minded; if there comes an established experiment to evaluate TBHs in Maine, then I stand ready to change my mind, but currently I cannot support the model being tried with constant failure. Having “new-bees” utilizing a methodology not fully tested beyond trial and error is a disservice to the MSBA membership and all other backyard beekeepers of which we are the majority. We should not be setting “new-bees” up for certain failure. The Langstroth hive has been around for over 150 years and is proven technology.